Jeff grew up in Wisconsin where he obtained his Bachelors of Science in Athletic Training at the University of Wisconsin-Madison. He spent two years at Boston University getting his Masters of Education in Health Education and working as an athletic trainer for the school with the rugby and track and field teams. Jeff then moved to Washington State and worked as an athletic trainer for a local high school, as well as treating a diverse group of patients in an outpatient clinic. Jeff takes great passion in helping his patients improve their ability to move and find relief from pain. He focuses on finding the source of dysfunction in the body and rehabilitating it through functional movement that will carry over into the patient’s everyday life. His goal is to provide each patient the education and tools they need to rehabilitate their injury and prevent future injury. Jeff is certified in the use of the Functional Movement Screen and the Selective Functional Movement Assessment. 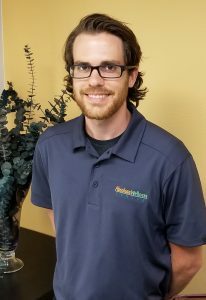 Jeff has worked with a wide range of patients, from professional, collegiate and high school athletes to workers injured on the job, weekend warriors, and the general population. He has rehabilitated injuries ranging from surgical cases to chronic pain and everything in between. In his off-time Jeff enjoys spending time with his girlfriend and dog and exploring the pacific northwest.